One of only 40 American liberal arts colleges included in Loren Pope’s Colleges That Change Lives, Eckerd offers a close and friendly community that values creative self-expression, volunteer service, and environmental activism. Our beautiful campus is located on 188 bayfront acres on the west coast of Florida. St. Petersburg, the Sunshine City, has more than 350 days of sun a year, with average temperatures that rarely fall below 21 degrees Celsius. St. Petersburg and the Tampa Bay area boast shopping and dining of every kind, major league sports teams (including baseball, football, and hockey), and white sand beaches, theme parks, and areas of natural beauty that make it one of the top tourist destinations in the world. Colleges, programs, and degrees: See “Majors” box. Geographic Diversity: The College’s 1,900 students come from 46 states, 41 countries, and every background, belief, and personality type imaginable. Financial Aid: All international applicants are automatically considered for merit-based scholarships that range between $12,000–$20,000 USD; Eckerd does not provide need-based aid to international students. * Early Action applicants will have a decision returned to them by December 15. The application fee is $40. The fee is waived for applications submitted by December 1. 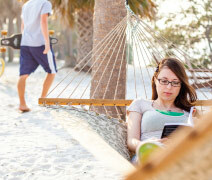 The intellectual atmosphere at Eckerd is engaging, open-minded, and innovative. The average class has 20 students, and there are no teaching assistants, so students get one-on-one attention from highly trained professors day in and day out. While other colleges devote three or four days to new-student orientation, Eckerd dedicates three whole weeks to it. Students attend a for-credit class in the morning and spend the rest of their time getting to know other students, the campus, and St. Petersburg. Autumn Term is one reason Eckerd was named to a list of just 13 “Institutions of Excellence in the First College Year,” issued by the Policy Center on the First Year of College. Ninety-five percent of Eckerd professors hold a PhD or the highest degree in their field. Each new student is assigned a mentor—a faculty member whose job it is to guide and support them through that big first year. New students take both the Autumn Term course and a sequence of two first-year courses with their mentors. These relationships often last well beyond the student’s first year. One of the most exceptional opportunities Eckerd provides is joint student-faculty research and scholarly projects. Students work closely with faculty to design original studies and gather, analyze, present, and even publish their findings. For example, the College recently sent five students to China for faculty-directed research, funded by a grant from the National Science Foundation’s International Research Experience for Students (IRES). Another 30 students stayed on the Eckerd campus that summer to do research along with their Eckerd professors. Most of this research takes place in our new $25 million LEED Platinum–certified James Center for Molecular and Life Sciences. Eckerd students have their pick of more than 200 internship placements carrying academic credit and more than 300 destinations for study abroad. Over 70% of Eckerd students study abroad—many more than once—during their time here. Eckerd has semester- and year-long programs and maintains its own study center in London. The three-week Winter Term offers fascinating and original courses ranging from a marine science course in which students travel to Cuba to a natural history course that explores the ecosystems of the Galapagos Islands. Eighty-eight percent of our students live on campus in one of 12 dorms, which include themed residences like the pet dorm—home to three dozen students and their dogs, cats, ferrets, and reptiles. Housing is guaranteed for four years, and all dorms are within easy walking distance of the library, classrooms, and labs as well as the cafeteria, beach, boathouse, and fitness center. In an average week, Eckerd hosts 100 campus activities, from the arts and sports to religious and political events. Everyone turns out for popular annual events like the Howl-O-Scream in October and Kappa Karnival in May. There is no stronger testament to the value of the education we provide than the feedback we receive from our graduates. In a recent survey, 92% of Eckerd students reported being satisfied with the quality of their education, 89% would choose to attend Eckerd again, and 90% would recommend Eckerd to a high school senior. Eckerd students have been described as “barefoot and brainy”—intrigued by ideas and serious about learning but fun-loving and adventurous too. So every fall, our admission counselors go on a mission to find the “right fit” for Eckerd through a holistic application review process. We realize that not everyone fits in a GPA/test score grid, and a student’s character is best expressed through personal essays and recommendation letters. We are also experts in a wide range of education systems from around the world and appreciate rigorous curricula such as IB, A Levels, IGCSE, Abitur, CAPE, etc. We have conditional admission for English proficiency, and students can come and complete ESL courses on our campus before they commence their academic life at Eckerd.